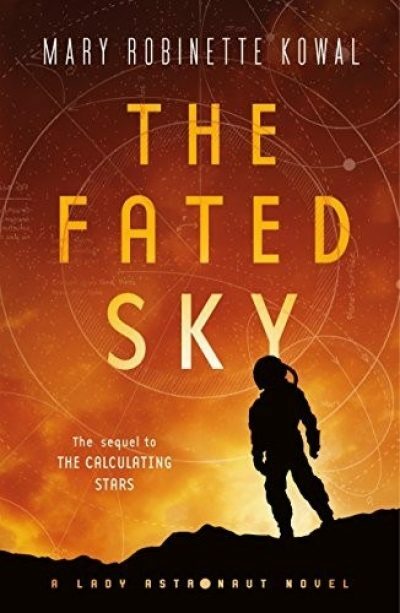 2018’s The Fated Sky is the second volume in Mary Robinette Kowal’s Lady Astronaut series. Earth is doomed … but not immediately. There is enough time to try to establish colonies on the other worlds of the Solar System, for a chosen few to survive catastrophe. But who, exactly, will qualify to be among the lucky handful to have a future? When a computer glitch lands the Cygnus 14 off course by 240 miles, it’s immediately swarmed by a group of armed men. Several of the men are black. All are convinced they and their loved ones will not benefit from the race to settle space. Taking astronauts hostage will, they hope, provide them with the chance to make their concerns heard. It’s a bold gambit and one that ends badly for the men. Still, Lady Astronaut Elma York has to admit they have a point. The demographics of the astronaut corps are far, far whiter and richer than the demographics of America, not to mention the world in general. Still, the future of humanity is on the line and surely in the long run decency will win out. Even before the expedition sets out, there are signs of discord. South African astronaut Vanderbilt DeBeer is openly contemptuous of the non-white astronauts. Rumour has it that his native South Africa insisted DeBeer’s assigned ship have an all white crew. Rumour also has it that South Africa is instigating rumours that the black International Aerospace Coalition staff was the group behind the Cygnus 14 off-course landing. Space is dangerous enough without engineered disagreements. Tainted supplies on Pinta lead to an outbreak of E. Coli. Pinta’s medic tries to handle the crisis on her own, which ends in tragedy. Efforts to patch an unrelated coolant leak leads to more tragedy. Mars is nowhere in sight and already the expedition is two members down. Thank goodness for South Africa! From the perspective of American authors looking for nations whose racial policies were even more questionable than the US, I mean1. Still, I suspect 1960s America would have no shortage of home-grown opposition to giving POC access to the space program (that is, beside supporting white folk efforts; that’s OK). To give some idea by how much Kowal has accelerated certain elements of the space program, the first African American astronaut to fly into space did not do so until 1983 and the Jewish American to fly into space did not do so until 1984. Of course, the first international crewed mission to Mars hasn’t happened at all, so astronaut corps integration isn’t the only development due only to the fact that the accelerator pedal has been mashed to the floor. Kowal takes the view that Americans would somehow decide to embrace decency if faced with extinction. How wonderful it must be to maintain such optimism. I on the other hand think people will happily spend twice as much to save a tenth as many people if doing it meant they could really stick it to some group they dislike. Agree to disagree. The Earth Firster extremists believe the space program is absorbing resources that might otherwise allow the millions of refugees from the big disaster in the previous book to escape the lives of poverty in which they are currently trapped2. The argument that humanity’s future depends on space is less than completely convincing, since it seems arguable that whatever segment of humanity survives the big boil to come won’t include the people from whose ranks Earth First draws its recruits. The book seems to take the view the EF is sympathetic but wrong: I am not sure the second part is actually the case. This isn’t a Fred Hoyle book so there aren’t pages of equations detailing how screwed the Earth is. Still, the absence of geoengineering is a bit odd. This is the era when people hoped to create instant harbours with carefully applied nuclear weapons3. Where are the eager Hudson Institute researchers with their bold plans to reduce insolation with aerosols injected into the upper atmosphere or by chrome-plating Texas? Perhaps they’re just off stage. The fatality rate on the first Mars mission may seem a bit excessive to some, but consider: not only is this first attempt made without the backing of decades of experience with uncrewed robot probes, it is made with 1960s-era technology, (with all the limitations that implies). I hadn’t considered the implications of uncontrollable diarrhea and free fall before now, so yay, new horrific images for the win. Apples with apples time: compared to the vast majority of novels in which entirely contrived disasters force humans into space, Kowal is playing a very different game. The usual practice is to decide that the disaster driving the plot justifies any minor demographic elisions in the exodus fleet, or perhaps the people left behind somehow deserved their fate; that the ends justify the means, or much more likely, the authors just ignore the issue aside from the inevitable panicked crowd charging the rocket just before take off scene. Kowal actually addresses the issues other authors ignore or wave away. Kowal is still making an effort to ensure that her cast is much more diverse than has been the norm for books of this sort. The technical details seem reasonable. So, caveats aside (lifeboat stories aren’t my thing; Kowal takes a far sunnier view of humans than I do), I give this a thumbs up. Readers who liked the previous book will no doubt enjoy this one as well. The Fated Sky is available here (Amazon) and here (Chapters-Indigo). 1: Canada, of course, has the US. If we didn’t, there’s always Australia. 2: You know what probably didn’t happen in this universe? The post-1953 portion of the Baby Boom. 3: The need to move massive amounts of material to Mars and the fact that the Earth is fucked anyway seems like an ideal opportunity for the Project Orion folks. But Orion post-dates the big impact. Maybe too many of the central players in Orion died in the aftermath? "I give this a reviewer thumbs up." ? Should 'reviewer' be 'book'? I think I edited in mid sentence or something.